1. Bring a large pot of water to a boil. Season the water with kosher salt - maybe a tablespoon or so. Cook the pasta until al dente, which means just done. It shouldn't be hard or mushy... Once it is done, drain it well add it to a large bowl. Drizzle olive oil over the pasta until it is well coated. Season the pasta with a little pepper to taste. 2. 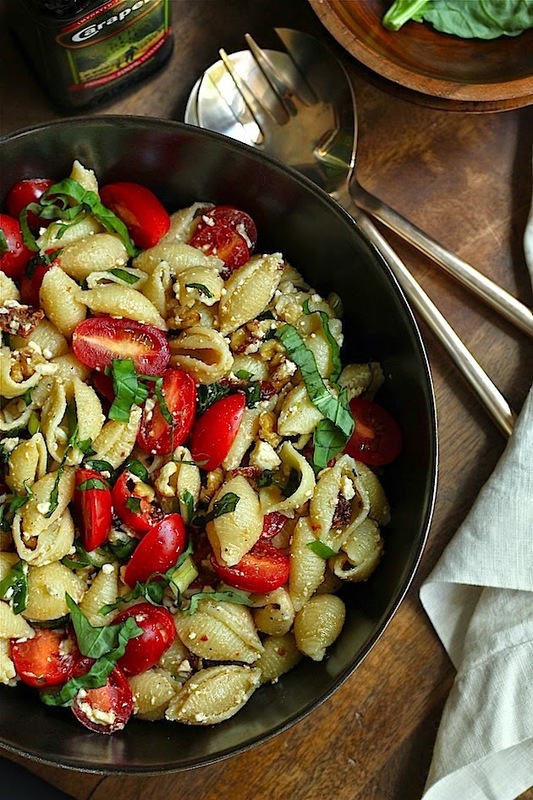 Once the pasta has cooled, add in the toasted walnuts, tomatoes, scallions, sundried tomatoes, basil, lemon juice and cheese. Toss very gently with a large spoon. Taste for seasonings and texture and adjust if necessary. Add a little more olive oil and/or lemon juice if it's too dry for your taste. 3. For maximum flavor, cover and refrigerate for a few hours. But it's good if eaten right away, too! Perfect side dish to bring to all those summer barbeques! Reminds me of Zoe's pasta salad, but not so heavy. And I love walnuts! Looks amazing. I am always impressed with your photography skills. Hope you are doing well. Don't ya just love spending time with your dad? It's very rare for my dad and I to get together so I really feel lucky when we do have time. I made him my grandmother's recipe for oatmeal chocolate chip cookies.... though I was informed that I didn't make them exactly how she made them. Talk about being honest. But now I know. As for your pasta, I will be sure to make this when I'm with my pops ...... I can't go wrong!!!! That salad looks really good! Great photos!